GuernseyBoating is a family run business founded by Captain Tich Harvey, offering a comprehensive range of personalised boating services in Channel Island waters. We believe that the marine environment is the most beautiful aspect of the Channel Islands and yet there is little opportunity for visitors or locals to get out there on the water and enjoy it. Have a look at our gallery for a taste of the opportunities on offer. We hope to change that through our range of services, so whatever your aspirations on the water, we can help you out. Whether you need to brush up on your local pilotage skills to confidently take your own boat to those beautiful anchorages, entertain some corporate clients with the best Guernsey has to offer or enjoy a relaxing multi-day cruise around the Channel Islands, we have the resources and experience to make this happen. Please see our Services section for further details, and don’t hesitate to contact us if there are any other boating services you think we could help with. 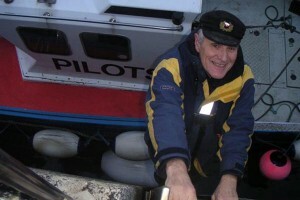 Captain Tich is a retired Guernsey harbour pilot and Master Mariner. He grew up next to St Sampson’s Harbour and has had a life long love of the sea, particularly Channel Island waters. He has over 50 years of experience at sea, including service in both the Royal Navy and the Merchant Navy. He has skippered a huge variety of vessels; from cross channel container ships to high speed passenger ferries, from motor cruisers to sailing yachts, from kayaks to RIBs, and everything inbetween! He has 15 years experience as a Master in Channel Island waters and 20 years as a Guernsey harbour pilot. During this time he has developed an extensive knowledge of Guernsey waters as well as Sark, Alderney and Jersey. He has instructed many Masters in preparation for their Guernsey special pilotage licence and sits on the Guernsey pilotage examination board. In his spare time he enjoys sailing in local waters, acting as relief skipper for private and commercial vessels and generally messing about in boats!